Electroanalytical Chemistry: A Series of Advances cites the work of Dr. Shawn Kathmann, Dr. Christopher Mundy, Dr. Gregory Schenter at Pacific Northwest National Laboratory and Dr. IFW Kuo at Lawrence Livermore National Laboratory. Congratulations to Dr. Shawn Kathmann, Dr. Christopher Mundy, Dr. Gregory Schenter at Pacific Northwest National Laboratory and Dr. IFW Kuo at Lawrence Livermore National Laboratory on having their work mentioned in Electroanalytical Chemistry: A Series of Advances. In the 249-page book, noted scientists review advances in electroanalytical chemistry, which influences nanosynthesis, life sciences and other fields. The team is mentioned for answering an ages-old question as to how to accurately measure the surface potential of water. As stated in Chapter 1, "Kathmann et al. report that the large surface potential values obtained from QM [quantum mechanical] methods arise because these values include the potential for regions within the atoms of the solvent molecules...Gradually excluding the atomic volume of the atoms of the solvent molecules from the calculations results in values for the surface potential of water that...[are] in much better agreement with the estimates from electrochemical measurements and with the values obtained using classical force fields." The team's research into the surface potential of water was funded by the U.S. Department of Energy's Office of Basic Energy Sciences, Chemical Sciences, Geosciences, and Biosciences Division. This research used computational resources in EMSL, a national scientific user facility; the National Energy Research Scientific Computing Center; and Livermore Computing. Bard AJ and CG Zoski. 2013. 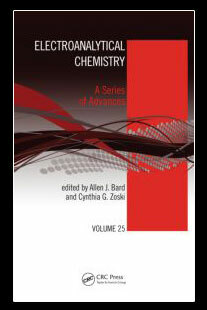 Electroanalytical Chemistry: A Series of Advances: Volume 25. CRC Press, Boca Raton, Florida.